TYGER AUTO focus on developing premium aftermarket auto parts that meet or exceed OE quality standards. TYGER Delux bike frame adaptor creates a top tube for non-conventional frames and keeps your bike mounted solidly on rack arm mounts.. Ideal for kids bikes women's bikes and sloping down tubes. 100% assembled. Creates a top tube for non-conventional frames. Ideal for kids bikes women's bikes and sloping down tubes. Keeps your bike mounted solidly on rack arm mounts. New push button clamps for quick installation and removal. Telescopic adjustment for all size bike frames and anti-rotation inserts for greater stability. Durable rubber collars secure easily and safely to bike stem and seat post. 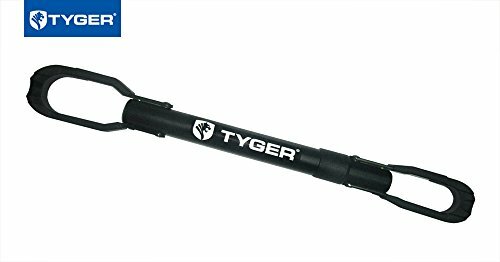 TYGER No-Hassle Limited Lifetime Warranty! If you have any questions about this product by Tyger Auto, contact us by completing and submitting the form below. If you are looking for a specif part number, please include it with your message.